Enjoy updated materials already being used successfully in middle school, secondary school, and university debates. Debate teams that clarify definitions tend to run away with winning conclusions. 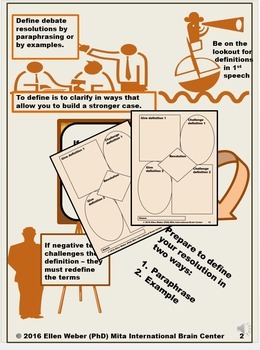 Use these materials to guide students into stating, supporting and defining their views. Prepare students for national tournaments, or help them to articulate ideas that will enhance common core standards mastery. 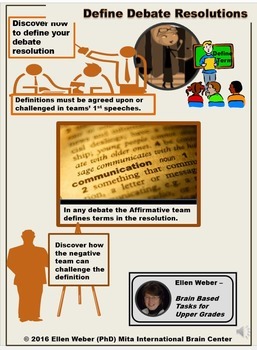 ~ Experience teams that define terms that their opponents must either accept or redefine. 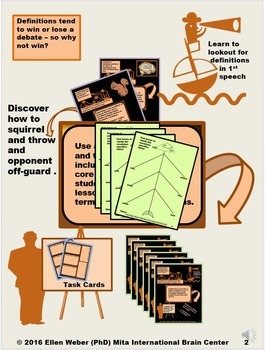 ~ Discover how to squirrel definitions and why these are allowed at times and banned at times. ~ Submit their definitions by a). paraphrasing and by b). examples on task cards provided. Use as posters, handouts and task cards that inspire your students to write and speak with clarity that wins. First they see examples for defining any resolution with clarity. Then they apply what they observe in samples included, to your debate your lesson topics. Use to achieve CCSS standard excellence, while gaining skills to speak and write on both sides of lesson topics. Do contact me at eweber1@frontiernet.net if I can further Hopefully these ready-to-roll brain-based materials will benefit your learners and leaders as they do mine at middle, secondary, university levels and beyond. Do follow my TpT site and keep up with brain-friendly materials to enhance your class. If you have any further questions about how to get the most from this product, please do contact me at ewebermita@gmail.com and I’ll be glad to help further. All the best as you learn and lead with the brain in mind! Join the Brain Based Circle! Connect with Me!